» Non-vitamin K Antagonist Oral Anticoagulant After Acute Coronary Syndrome: Is There a Role? Non-vitamin K Antagonist Oral Anticoagulant After Acute Coronary Syndrome: Is There a Role? Despite dual antiplatelet therapy (DAPT) including potent P2Y12 inhibitors, recurrent ischaemic events occur in a significant number of patients after acute coronary syndrome (ACS), warranting new antithrombotic strategies. Combinations of non-vitamin K antagonist oral anticoagulant (NOAC) with antiplatelet therapy have been tested in several large phases II and III randomised trials. Overall, current evidence suggests that the use of NOACs on top of DAPT after ACS reduces the rate of recurrent ischaemic events, albeit at the price of increased risk for major bleeding. In the particular field of patients with ACS and atrial fibrillation, NOACs may be associated with reduced bleeding complications compared with vitamin K antagonist. Further randomised trials evaluating low-dose NOAC combined with single antiplatelet therapy are warranted. RM declare fees for serving on a data and safety monitoring board from Watermark Research Partners, fees for serving on executive committees from Janssen Pharmaceuticals and Osprey Medical, consulting fees from AstraZeneca, the Medicines Company, Medscape, Boston Scientific, Merck & Company, Cardiovascular Systems, Inc. (CSI), Sanofi, and Shanghai BraccoSine Pharmaceutical Corporation, and grant support to her institution from Eli Lilly/ Daiichi-Sankyo, Bristol-Myers Squibb, AstraZeneca, the Medicines Company, OrbusNeich, Bayer, CSL Behring, Abbott Laboratories, Watermark Research Partners, Novartis Pharmaceuticals, Medtronic, and AUM Cardiovascular. GP and BV have no conflicts of interest to declare. Dual antiplatelet therapy (DAPT) including aspirin and a P2Y12 inhibitor is the current gold standard for the treatment and mid-term secondary prevention of acute coronary syndrome (ACS).1–4 However, despite the use of potent P2Y12 inhibitors such as ticagrelor or prasugrel, patients remain at high ischaemic risk after ACS. More specifically, in the prasugrel treatment arm of the TRial to Assess Improvement in Therapeutic Outcomes by Optimizing Platelet InhibitioN with Prasugrel – Thrombolysis In Myocardial Infarction (TRITON-TIMI) 38 trial,5 the rate of the combined endpoint of cardiovascular (CV) death, non-fatal MI or urgent target-vessel revascularisation was 9.9 % within 15 months. In the PLATelet Inhibition and Patient Outcomes (PLATO) trial,6 the rate of the composite of CV death, MI, stroke, severe or not recurrent ischaemia, transient ischaemic attack or other arterial thrombotic events in the ticagrelor arm was 14.6 % within 12 months. Hence, there is clearly room for improvement and reduction of ischaemic events after ACS. The underlying mechanism of an acute ischaemic event is mostly intracoronary thrombus formation on the basis of an atherosclerotic plaque, leading to a more-or-less complete obstruction of the coronary vessel and resulting in myocardial cell injury or death.7 The rupture or erosion8–10 of the fibrous cap of an atherosclerotic coronary plaque exposes the highly thrombotic necrotic core to the circulating blood triggering pathways, leading to activation of platelets and the coagulation cascade.11,12 Hence, both antiplatelet agents and anticoagulants are effective and recommended in the acute treatment of ACS until revascularisation is achieved.1–3 However, coagulation may remain activated even after the acute phase, resulting in adverse outcomes.13 Therefore, administration of anticoagulants in addition to antiplatelet agents may be an attractive strategy to further reduce recurrent ischaemic events on a long-term basis. 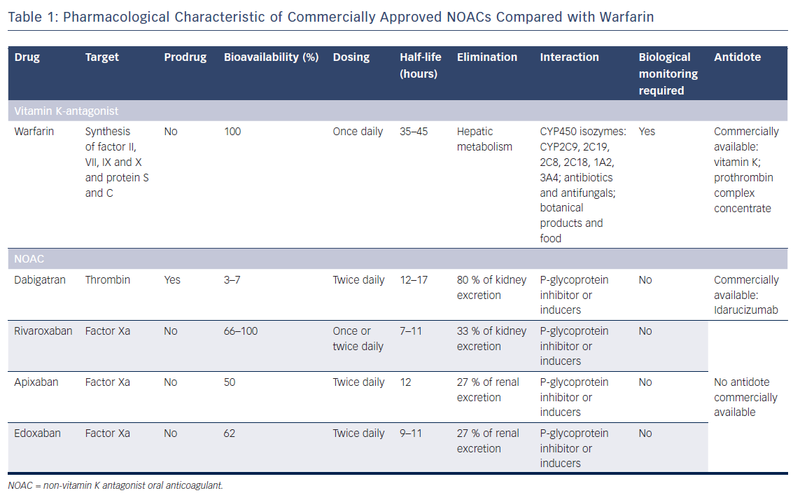 Non-vitamin K oral anticoagulants (NOACs) are direct anticoagulant agents with more favourable pharmacological properties than VKA,17 as detailed in Table 1. One of the main limitation of the use of NOACs may be the limited access to an antidote for effect reversal, compared with VKA. A antibody fragment, idarucizumab, recently received US Food and Drug Administration approval to reverse the anticoagulant effect of dabigatran, a thrombin inhibitor, in cases of life-threatening bleeding or urgent surgical procedure.18 There is currently no commercially available antidote for direct factor-Xa inhibitors, such as apixaban, rivaroxaban or edoxaban. Andexanet alfa, a recombinant modified human factor Xa decoy, was recently tested in a small phase III study and will require further investigations.19 Notwithstanding this limitation, in randomised trials and real-world registries, NOACs demonstrated an overall safer profile than VKA, with reduced rates of major bleeding and/or intracranial haemorrhage when used to prevent thromboembolic complication of AF.20–24 Recent phase II and III trials have investigated the potential benefits of NOACs in combination with single or dual antiplatelet therapy in patients after ACS (Table 2). The RandomizEd Dabigatran Etexilate Dose Finding Study in Patients With Acute Coronary Syndromes Post Index Event With Additional Risk Factors for Cardiovascular Complications Also Receiving Aspirin and Clopidogrel: Multi-centre, Prospective, Placebo Controlled, Cohort Dose Escalation Study (RE-DEEM) trial was a phase II trial that investigated dabigatran in the setting of ACS.25 In this study, 1,878 high-risk patients were randomised within 14 days after an ACS to receive either dabigatran (50 mg, 75 mg, 110 mg or 150 mg twice daily) or placebo as well as DAPT with aspirin and clopidogrel. The primary endpoint was the composite of major or clinically relevant minor bleeding at 6 months after randomisation. There was a dose-dependent increase in the rate of the primary outcome, with a hazard ratio (HR) of 1.77 (95 % CI [0.7–4.5]) for 50 mg twice daily; HR 2.17 (95 % CI [0.88–5.31]) for 75 mg twice daily; HR 3.92 (95 % CI [1.72–8.95]) for 110 mg twice daily and HR 4.27 (95 % CI [1.86–9.81]) for 150 mg twice daily. The rates of cardiovascular death, MI and stroke were lower in patients receiving the two higher doses (110 mg and 150 mg) compared with patients receiving the two lower dabigatran doses (50 mg and 75 mg). The APixaban for Prevention of Acute Ischaemic Events (APPRAISE) trial was a phase II randomised, placebo-controlled study evaluating apixaban at different dosages (2.5 mg twice daily, 10 mg once daily, 10 mg twice daily or 20 mg once daily) among 1,715 high-risk patients enrolled within 7 days of an ACS. All patients received aspirin and 76 % received additional clopidogrel.26 A dose-dependent increase in International Society of Thrombosis and Haemostasis (ISTH) major bleeding or clinically relevant non-major bleeding was observed within 6 months with apixaban 2.5 mg twice daily (5.7 %; 95 % CI [3.4–8.9]) and 10 mg once daily (7.9 %; 95 % CI [5.2–11.5]) compared with placebo (3.0 %; 95 % CI [1.8–4.7]). Of note, enrolment was prematurely interrupted for the two highest doses (10 mg twice daily and 20 mg once daily) due to high rates of relevant bleeding. The composite efficacy endpoint of CV death, MI, severe recurrent ischaemia and stroke was lower with apixaban 2.5 mg twice daily and apixaban 10 mg once daily compared with placebo. Following these results, the APPRAISE-2 phase III randomised, placebo-controlled trial was performed to investigate apixaban 5 mg twice daily in addition to DAPT among high-risk patients enrolled within 7 days of an ACS.27 After recruitment of 7,392 patients out of the 10,800 initially planned, the trial was stopped prematurely because of a significant increase in the rate of thrombolysis in myocardial infarction (TIMI) major bleeding with apixaban compared with placebo (HR 2.59; 95 % CI [1.5–4.46]; p=0.001) without significant differences in the rates of CV death, MI or stroke. Rivaroxaban was investigated in the setting of ACS within the phase II Anti-Xa Therapy to Lower Cardiovascular Events in Addition to Standard Therapy in Subjects with Acute Coronary Syndromes – Thrombolysis In Myocardial Infarction (ATLAS ACS-TIMI) 46 trial.28 In total, 3,491 patients were enrolled within 7 days of an ACS and stratified into the aspirin only (stratum 1, n=761 patients) or DAPT (stratum 2, n=2,730) groups. In a second step, patients were randomised to receive either placebo or rivaroxaban (5 mg, 10 mg, 15 mg or 20 mg once daily). The risk of clinically significant bleeding associated with rivaroxaban compared with placebo increased in a dose-dependent manner (HR 2.21, 95 % CI [1.25–3.91] for 5 mg; HR 3.35, 95 % CI [2.31–4.87] for 10 mg; HR 3.6, 95 % CI [2.32–5.58] for 15 mg; and HR 5.06, 95 % CI [3.45–7.42] for 20 mg doses; p<0.001). With regard to ischaemic events, rivaroxaban reduced the risk for the main secondary efficacy endpoint (a composite of death, MI and stroke) compared with placebo (3.9 % versus 5.5 %; HR 0.69, 95 % CI [0.5–0.96], p=0.027). These encouraging results led to the initiation of the ATLAS-ACS 2-TIMI 51 trial, a phase III study, that enrolled 15,526 patients with recent ACS, randomising them to either rivaroxaban (2.5 mg or 5 mg twice daily) or placebo.29 In ~93 % of patients, background therapy included a thienopyridine in addition to aspirin. After a mean treatment period of 13.1 months, rivaroxaban (both doses combined) significantly reduced the rate of the composite of CV death, MI and stroke compared with placebo (8.9 % versus 10.7 %; HR 0.84, 95 % CI [0.74–0.96], p=0.008). While the twice-daily 2.5 mg dose of rivaroxaban reduced the rates of CV death (2.7 % versus 4.1 %, p=0.002) and all-cause death (2.9 % versus 4.5 %, p=0.002), rivaroxaban 5 mg twice daily did not show any survival benefit compared with placebo. Rates of major bleeding were increased with 2.1 % versus 0.6 % for rivaroxaban compared with placebo (p<0.001). While the rate of intracranial haemorrhage was increased (0.6 % versus 0.2 %, p=0.009), there was no significant difference with regard to fatal bleeding (0.3 % versus 0.2 %, p=0.66). The discrepancy between the results of the APPRAISE-2 and ATLAS 2-TIMI 51 trials may be explained by a higher-risk profile of patients enrolled in the former compared with the latter (Table 2). Indeed, patients from the APPRAISE-2 trial were older and had more frequent diabetes or chronic kidney disease. In ATLAS ACS 2-TIMI 51, prior stroke was an exclusion criterion in patients on DAPT, while approximately 10 % of the APPRAISE-2 study population had a history of cerebrovascular disease. Finally, the dose of apixaban tested in APPRAISE-2 was the same as the one used for thromboembolic prevention of AF, while in ATLAS 2-TIMI 51, relatively lower doses of rivaroxaban were tested. A lower dose of rivaroxaban in combination with a single antiplatelet therapy was also used in the Study to Compare the Safety of Rivaroxaban Versus Acetylsalicylic Acid in Addition to Either Clopidogrel or Ticagrelor Therapy in Participants With Acute Coronary Syndrome (GEMINI-ACS) 1 trial.30 In this phase II study, 3,037 patients with recent ACS were randomised to receive either rivaroxaban 2.5 mg twice daily or aspirin 100 mg once daily. The randomisation was stratified by the background therapy of either clopidogrel (43.9 % of the patients) or ticagrelor (56.1 % of the patients), which was at the discretion of the treating physician. At a median treatment duration of 291 (range 239–354) days, there was no difference in terms of TIMI clinically significant bleeding between the rivaroxaban and the aspirin group (HR 1.09; 95 % CI [0.8–1.5], p=0.584). The GEMINI-ACS trial demonstrated that the association of NOAC and single antiplatelet therapy was safe after ACS. However, this trial was not powered to show any meaningful differences in ischaemic events between treatment groups. The results of the GEMINI trial were confirmed by a recent meta-analysis of seven randomised trials including 31,574 patients, which showed that the addition of NOACs to a single antiplatelet therapy did not increase the rate of clinically significant bleeding.31 Of note, there was no significant reduction of ischaemic events with this combination. Another meta-analysis looked at the effect of NOAC plus antiplatelet therapy in accordance to baseline clinical presentation in patients with ACS.32 While this treatment strategy was not associated with any benefit in NSTE-ACS patients, it was associated in STEMI patients with a decreased risk of ischaemic events. This analysis suggests that a combination of NOACs plus antiplatelet therapy is an attractive option only in patients with high thrombotic risk, in line with the recent results of the Cardiovascular OutcoMes for People Using Anticoagulation StrategieS (COMPASS) trial on high-risk patients with stable atherosclerotic vascular disease.33 Of note, bleeding risk was increased with adding NOACs to antiplatelet therapy compared with antiplatelet therapy alone in both NSTE-ACS and STEMI patients. AF has been reported to occur in up to 21 % of ACS patients.34–36 This particular population constitutes a challenge in terms of prevention of ischaemic events. While DAPT is superior to VKA with respect to the prevention of coronary thrombosis,14,15 VKAs are superior to DAPT regarding the prevention of thromboembolic complications associated with AF.37 Hence, these patients are frequently treated with a triple therapy, including an oral anticoagulant and DAPT,38 which is associated with increased rates of major haemorrhage.39,40 Combinations including NOACs and antiplatelets may reduce the risk of bleeding compared with triple therapy including a VKA. In the Open-Label, Randomized, Controlled, Multicenter Study Exploring Two Treatment Strategies of Rivaroxaban and a Dose-Adjusted Oral Vitamin K Antagonist Treatment Strategy in Subjects With Atrial Fibrillation Who Undergo Percutaneous Coronary Intervention (PIONEER AF-PCI) trial, triple therapy with DAPT plus VKA was compared with two other regimens: rivaroxaban 2.5 mg twice daily plus DAPT for 1 to 12 months; or rivaroxaban 15 mg once daily plus a P2Y12 inhibitor for 12 months.41 The initial presentation was ACS in 51.6 % of patients. At 12 months, rates of clinically significant bleeding were significantly lower in the two groups receiving rivaroxaban compared with standard therapy, with similar rates of ischaemic events. A similar concept was tested with dabigatran in the Randomised Evaluation of Dual Antithrombotic Therapy with Dabigatran versus Triple Therapy with Warfarin in Patients with Non-valvular Atrial Fibrillation Undergoing Percutaneous Coronary Intervention (RE-DUAL PCI) trial.42 The gold standard association of DAPT and VKA was compared with the association of a P2Y12 inhibitor (overwhelmingly clopidogrel) and dabigatran, either 110 mg or 150 mg twice daily. With an ACS for index event for 50.5 % of the population and after a mean follow-up of 14 months, both doses of dabigatran were associated with an improvement in term of ISTH major or clinically relevant bleeding (for 110 mg twice daily HR 0.52, 95 % CI [0.42–0.63], p<0.001; for 150 mg twice daily HR 0.72, 95 % CI [0.58–0.88], p=0.002). The criteria of non-inferiority regarding thromboembolic events, death or unplanned revascularisation was met (HR 1.04, 95 % [CI 0.84–1.29], p=0.005 for non-inferiority for the combined dose of dabigatran). Similar trials are being performed to evaluate other NOACs agent in the setting of ACS or PCI and AF. The EdoxabaN TReatment versUS Vitamin K Antagonist in PaTients with Atrial Fibrillation undergoing Percutaneous Coronary Intervention (ENTRUST-AF-PCI) trial is testing apixaban 2.5 or 5 mg twice daily (NCT02415400) while the Study of Apixaban in Patients With Atrial Fibrillation, Not Caused by a Heart Valve Problem, Who Are at Risk for Thrombosis (Blood Clots) Due to Having Had a Recent Coronary Event, Such as a Heart Attack or a Procedure to Open the Vessels of the Heart (AUGUSTUS-AF-ACS) trial is testing edoxaban 30 or 60 mg once daily (NCT02866175). 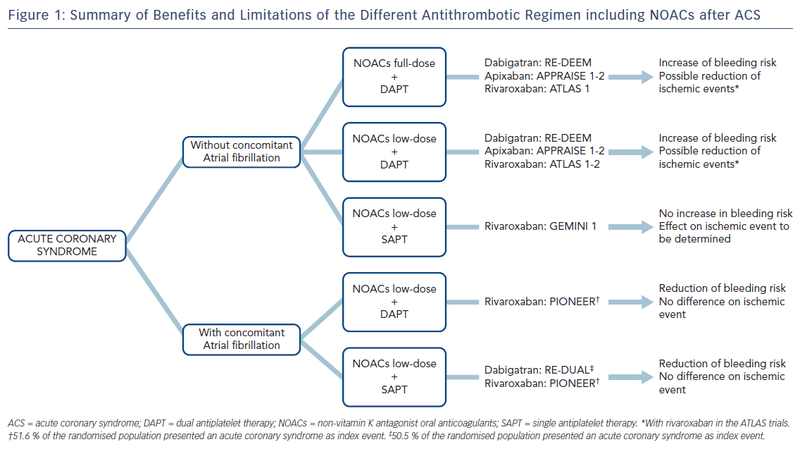 NOACs After ACS: Is There a Role? While higher doses of NOACs in combination with DAPT have been shown to be associated with decreased ischaemic events, the bleeding risk was markedly increased with these regimens compared with antiplatelet therapy alone in patients after ACS (Figure 1). Conversely, there is evidence that a strategy including lower doses of NOACs in combination with a single antiplatelet therapy may be safe. A significant reduction of ischaemic events associated with this strategy has yet to be proven. Further studies are needed to evaluate the role of NOACs after ACS and to identify the patient population that may benefit the most of such treatment. Windecker S, Kolh P, Alfonso F, et al. 2014 ESC/EACTS guidelines on myocardial revascularization: the Task Force on Myocardial Revascularization of the European Society of Cardiology (ESC) and the European Association for Cardio-Thoracic Surgery (EACTS) developed with the special contribution of the European Association of Percutaneous Cardiovascular Interventions (EAPCI). Eur Heart J 2014;35:2541–619. Roffi M, Patrono C, Collet J-P, et al. 2015 ESC guidelines for the management of acute coronary syndromes in patients presenting without persistent ST-segment elevation: Task Force for the Management of Acute Coronary Syndromes in Patients Presenting without Persistent ST-Segment Elevation of the European Society of Cardiology (ESC). Eur Heart J 2016;37:267–315. Ibanez B, James S, Agewall S, et al. 2017 ESC guidelines for the management of acute myocardial infarction in patients presenting with ST-segment elevation: the Task Force for the Management of Acute Myocardial Infarction in Patients Presenting with ST-segment Elevation of the European Society of Cardiology (ESC). Eur Heart J 2018;39:119–77. Levine GN, Bates ER, Bittl JA, et al. 2016 ACC/AHA guideline focused update on duration of dual antiplatelet therapy in patients with coronary artery disease: a report of the American College of Cardiology/American Heart Association Task Force on Clinical Practice Guidelines. J Am Coll Cardiol 2016;68:1082–115. Libby P. Mechanisms of acute coronary syndromes and their implications for therapy. N Engl J Med 2013;368:2004–13. Fuster V, Moreno PR, Fayad ZA, et al. Atherothrombosis and high-risk plaque: part I: evolving concepts. J Am Coll Cardiol 2005;46:937–54. Hansson GK. Inflammation, atherosclerosis, and coronary artery disease. N Engl J Med 2005;352:1685–95. Lippi G, Franchini M, Targher G. Arterial thrombus formation in cardiovascular disease. Nat Rev Cardiol 2011;8:502–12. Silvain J, Collet J-P, Nagaswami C, et al. Composition of coronary thrombus in acute myocardial infarction. J Am Coll Cardiol 2011;57:1359–67. De Caterina R, Husted S, Wallentin L, et al. General mechanisms of coagulation and targets of anticoagulants (Section I). Position Paper of the ESC Working Group on Thrombosis – Task Force on Anticoagulants in Heart Disease. Thromb Haemost 2013;109:569–79. Ardissino D, Merlini PA, Bauer KA, et al. Coagulation activation and long-term outcome in acute coronary syndromes. Blood 2003;102:2731–5. Schömig A, Neumann FJ, Kastrati A, et al. A randomized comparison of antiplatelet and anticoagulant therapy after the placement of coronary-artery stents. N Engl J Med 1996;334:1084–9. Leon MB, Baim DS, Popma JJ, et al. 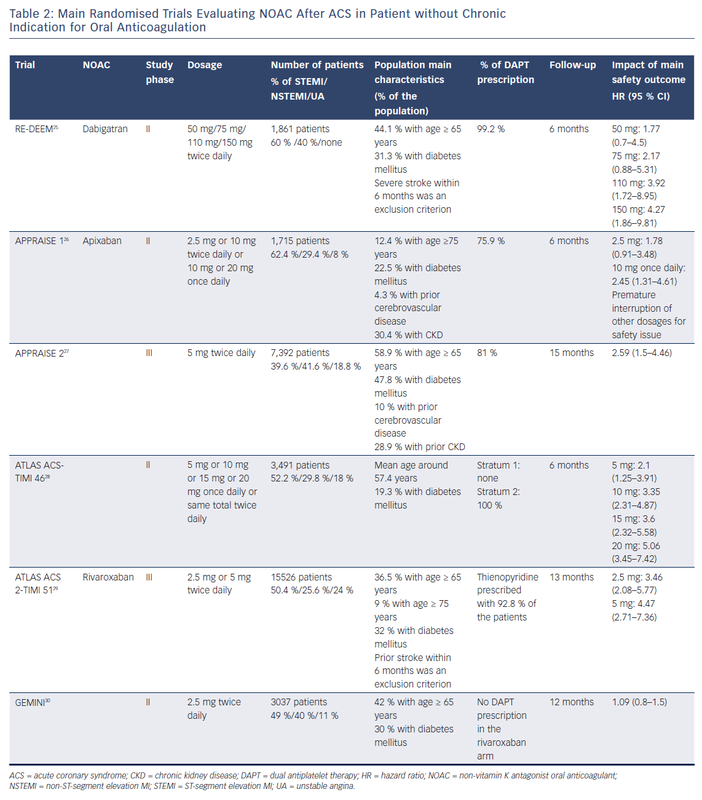 A clinical trial comparing three antithrombotic-drug regimens after coronary-artery stenting. Stent Anticoagulation Restenosis Study Investigators. N Engl J Med 1998;339:1665–71. Andreotti F, Testa L, Biondi-Zoccai GGL, et al. Aspirin plus warfarin compared to aspirin alone after acute coronary syndromes: an updated and comprehensive meta-analysis of 25,307 patients. Eur Heart J 2006;27:519–26. De Caterina R, Husted S, Wallentin L, et al. Oral anticoagulants in coronary heart disease (Section IV). Position paper of the ESC Working Group on Thrombosis – Task Force on Anticoagulants in Heart Disease. Thromb Haemost 2016;115:685–711. Pollack CV, Reilly PA, Eikelboom J, et al. Idarucizumab for dabigatran reversal. N Engl J Med 2015;373:511–20. Connolly SJ, Milling TJ, Eikelboom JW, et al. Andexanet alfa for acute major bleeding associated with factor Xa inhibitors. N Engl J Med 2016;375:1131–41. Connolly SJ, Ezekowitz MD, Yusuf S, et al. Dabigatran versus warfarin in patients with atrial fibrillation. N Engl J Med 2009;361:1139–51. Granger CB, Alexander JH, McMurray JJV, et al. Apixaban versus warfarin in patients with atrial fibrillation. N Engl J Med 2011;365:981–92. Patel MR, Mahaffey KW, Garg J, et al. Rivaroxaban versus warfarin in nonvalvular atrial fibrillation. N Engl J Med 2011;365:883–91. Beyer-Westendorf J, Förster K, Pannach S, et al. Rates, management, and outcome of rivaroxaban bleeding in daily care: results from the Dresden NOAC registry. Blood 2014;124:955–62. Larsen TB, Skjøth F, Nielsen PB, et al. Comparative effectiveness and safety of non-vitamin K antagonist oral anticoagulants and warfarin in patients with atrial fibrillation: propensity weighted nationwide cohort study. BMJ 2016;353:i3189. APPRAISE Steering Committee and Investigators, Alexander JH, Becker RC, et al. Apixaban, an oral, direct, selective factor Xa inhibitor, in combination with antiplatelet therapy after acute coronary syndrome: results of the Apixaban for Prevention of Acute Ischemic and Safety Events (APPRAISE) trial. Circulation 2009;119:2877–85. Mega JL, Braunwald E, Mohanavelu S, et al. Rivaroxaban versus placebo in patients with acute coronary syndromes (ATLAS ACS-TIMI 46): a randomised, double-blind, phase II trial. Lancet 2009;374:29–38. Ohman EM, Roe MT, Steg PG, et al. Clinically significant bleeding with low-dose rivaroxaban versus aspirin, in addition to P2Y12 inhibition, in acute coronary syndromes (GEMINI-ACS-1): a double-blind, multicentre, randomised trial. Lancet 2017;389:1799–808. Khan SU, Arshad A, Riaz IB, et al. Meta-analysis of the safety and efficacy of the oral anticoagulant agents (apixaban, rivaroxaban, dabigatran) in patients with acute coronary syndrome. Am J Cardiol 2018;121:301–7. Chiarito M, Cao D, Cannata F, et al. Direct oral anticoagulants in addition to antiplatelet therapy for secondary prevention after acute coronary syndromes: a systematic review and meta-analysis. JAMA Cardiol 2018;3:234–41. Eikelboom JW, Connolly SJ, Bosch J, et al. Rivaroxaban with or without aspirin in stable cardiovascular disease. N Engl J Med 2017;377:1319–30. Hansen ML, Sørensen R, Clausen MT, et al. Risk of bleeding with single, dual, or triple therapy with warfarin, aspirin, and clopidogrel in patients with atrial fibrillation. Arch Intern Med 2010;170:1433–41. Almendro-Delia M, Valle-Caballero MJ, Garcia-Rubira JC, et al. Prognostic impact of atrial fibrillation in acute coronary syndromes: results from the ARIAM registry. Eur Heart J Acute Cardiovasc Care 2014;3:141–8. Lamberts M, Olesen JB, Ruwald MH, et al. Bleeding after initiation of multiple antithrombotic drugs, including triple therapy, in atrial fibrillation patients following myocardial infarction and coronary intervention: a nationwide cohort study. Circulation 2012;126:1185–93. ACTIVE Writing Group of the ACTIVE Investigators, Connolly S, Pogue J, et al. Clopidogrel plus aspirin versus oral anticoagulation for atrial fibrillation in the Atrial fibrillation Clopidogrel Trial with Irbesartan for prevention of Vascular Events (ACTIVE W): a randomised controlled trial. Lancet 2006;367:1903–12. Kirchhof P, Benussi S, Kotecha D, et al. 2016 ESC guidelines for the management of atrial fibrillation developed in collaboration with EACTS. Eur Heart J 2016;37:2893–962. Vandvik PO, Lincoff AM, Gore JM, et al. Primary and secondary prevention of cardiovascular disease: Antithrombotic Therapy and Prevention of Thrombosis, 9th ed: American College of Chest Physicians Evidence-Based Clinical Practice Guidelines. Chest 2012;141:e637S–68S. Rubboli A, Faxon DP, Juhani Airaksinen KE, et al. The optimal management of patients on oral anticoagulation undergoing coronary artery stenting. The 10th anniversary overview. Thromb Haemost 2014;112:1080–7. Gibson CM, Mehran R, Bode C, et al. Prevention of bleeding in patients with atrial fibrillation undergoing PCI. N Engl J Med 2016;375:2423–34. Cannon CP, Bhatt DL, Oldgren J, et al. Dual antithrombotic therapy with dabigatran after PCI in atrial fibrillation. N Engl J Med 2017;377:1513–24.